I'll say right upfront that I cant tell you where I bought this dress. I'm going to be dishing a bit of dirt here, so its probably best if I dont name names. The year was... I dont know. It was a while ago. I was single, short on cash and just discovering vintage. 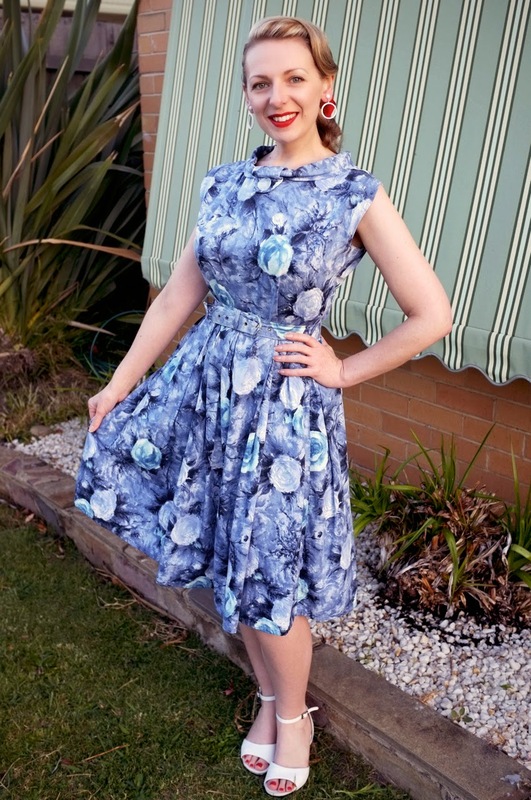 Back then eBay wasn't really a thing, so I either shopped at the op shop or made my own repro dresses from vintage patterns. 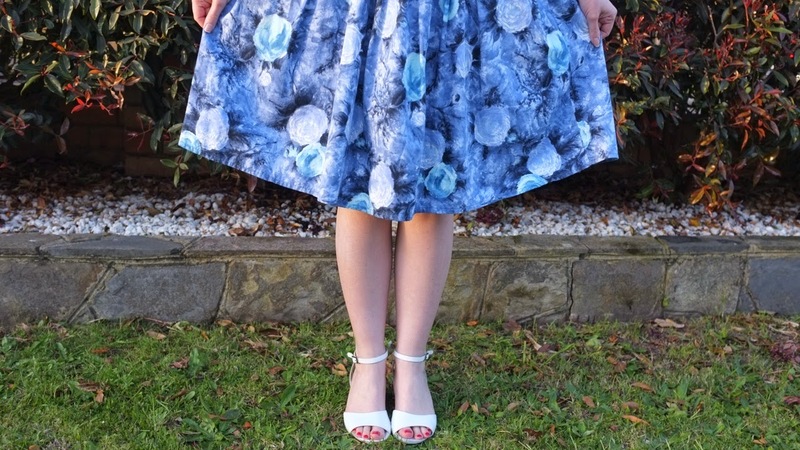 I didnt have any proper vintage dresses, but that was all about to change. So one day, I went to a vintage store with two of my friends. It was great store for two reasons. There was lots of cute dresses, and there was also a cute guy working behind the counter. 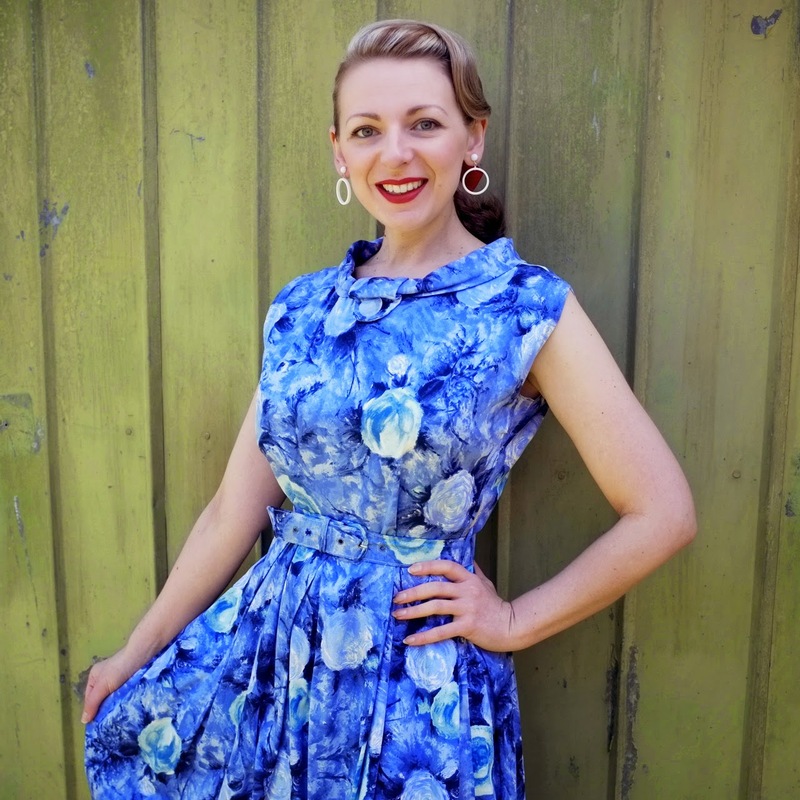 I picked out this blue floral polished cotton dress and instantly fell in love. (With the dress, not the guy.) 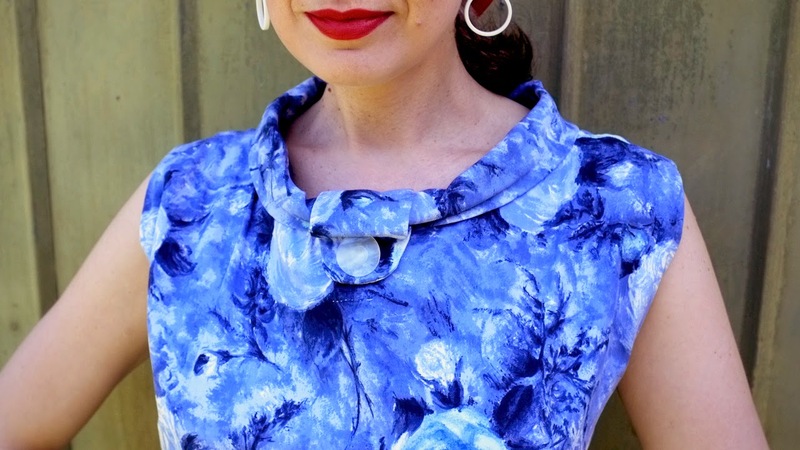 It was to be my first 1950s dress, and it was only $20... Score! As I paid for the dress, my friends gleefully tiptoed away, leaving me alone in the store with the cute guy. (They were always doing stuff like this, trying to help a sister out.) We started chatting, and before I knew it, I had agreed to meet him for a drink that night... Double score! That night, I arrived at the bar in my new favourite dress, strategically showing up ten minutes late. He wasnt there. I perched up at the bar and ordered a cider. By the time I was halfway through the cider, he still hadnt appeared, so I sent him a text along the lines of, Hey! Im at the front bar. He responded with something like, Oh sorry, Im at home. I cant come." Okay. Well, at least he responded! I decided to meet up with my friends and watch some bands instead. I downed the rest of my cider and hailed a cab. Lucky for me, the driver wasnt the talkative type, and I sat in the back, silently staring out the window wondering why cute guys were such jerks. I smiled sadly, slammed the door and went to find my friends. I may have missed out on a date with a cute guy, but at least a cab driver thought I was hot. Weeks later, I found out the cute guy actually had a girlfriend and no business meeting girls for drinks. Suddenly I was glad hed stood me up. Plus, I got a really nice dress out of it, and thats what really counts. Shortly after, I met a much cuter guy who never stood me up. Ever. Here's to vintage dresses and new beginnings... Do you remember your first vintage purchase? Funny story!!!! This dress suits you really well. Thanks for sharing your story Laurence! I've never been to any vintage stores that charge by weight... They must have been so good back when vintage was plentiful! Thanks Naomi... I've been holding onto this dress (and the story) for a long time!